Replaced firing pin stop to Wilson CombatC 70's square type (said to reduce muzzle flip, and is the spec of the original design. Smoothened a very few tooling marks. Second 100 rounds with the mods still no failures, evidently better groups (cause this time i learned to "properly"
Stock functioned well naman, but then you tend to want more and have some parts close to premium grade, Enjoy naman sa drill - disassembly, cleaning, lubricating reassembly, function checks, and specially shooting outdoors and scaring the biyenan(joke) haha. I hope the gun GAS bug doesn't bite me again. 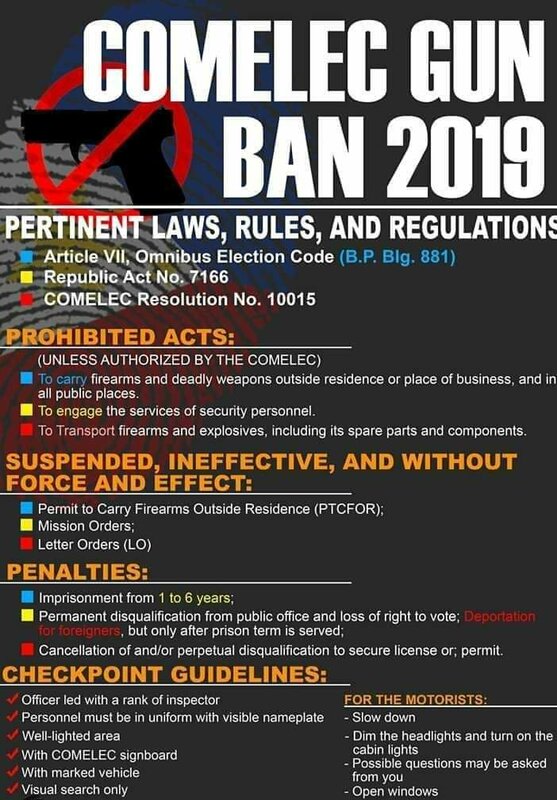 never pa ako nakapunta sa mga gunshow sana sa november magkaroon. Tindi, I like my glock in stock pero gusto ko din sana ng additional barrel sa G19 ko so I could shoot lead, yun lang haha . I have 2 kids now. Change priorities. My stock glock barrel never had problems with lead bullets. Basta hindi buntis yung basyo. Whats your take on Kimber Warrior vs Kimber Raptor? on both .45. Have you already bought either of the two? Para sakin the warrior could have been perfect except for the rails. It could be hard to find a concealed carry holster for 1911 with rails, or that gun might even be difficult to carry and/or draw from your waist under concealed carry. You could visit the store and try putting them on "mexican carry style" and compare the feel with a non railed 1911. Also consider that a CC holster for a railed 1911 would also bring more bulk. If your purpose or is allowed for open carry, range gun or maybe competition, then I'd definitely get the Warrior, primarily because it doesn't have the Series II safety, yung sa Raptor II meron and all Series II Kimber pistols. I own a basic Custom II that has this S2 safety. I removed a part of it, yung firing pin block lang and the spring that is pushing it. I like the series II safety, it doesn't interfere or affects the trigger, I havent have problems with it, no misfire so far when it is still in my Custom, the safety is deactivated when the grip safety is pushed, that is when you hold the gun. But there might be a one issue. Issue is I found that the timing of that S2 safety on my Custom is off. The grip safety would give the clearance to the trigger first before the firing pin channel is totally clear of the firing pin block. It should be the reverse or ideally the timing for the clearance for both safety is equal. If the trigger is cleared first but the block is not totally out of the channel then the firing pin could still get caught and possibly cause a misfire. This is possible if the grip safety is not fully depressed or depressed to the point that it only give clearance to the trigger. I haven’t have a misfire from my Custom when it still have the S2 safety cause I have a firm grip when firing. The thought of if not firing when you needed it is what bothers me, in under stressful condition your grip may vary. Some Series II pistol users in the 1911 forums reported a misfires or light strike I should say. Anyway both the Warrior and Raptor II is under the sub $1.5k, both should function well. Both are beautiful in black. If wala namang problem sa S2 safety ng Raptor II and the possibility of accidental dischage is your concern, get the Raptor. Anyway with that money, you have a lot of option. Or baka Nakabili ka na, haha. I was eyeing for the Warrior before. Kita ko yang revised IRR 2018 of RA10591, pagkakaintindi ko pwedeng parang duty carry pero concealed sa bag like belt bag on the side. Basta not inside the waistband, so bawal yung mga IWB holsters . Recoil sping from 16lbs to WC 17 lbs. trigger parts will stay unmodded. meron ba dito na issue ng type 3 to 5 paano nila na assesed na kailangan ka bigyan ng ganon type? per IRR nakikita ko lang na addition sa requirement is subject for inspection, scheduled, visual only. ha, wouldn't be much of a prob kung madaming pera yung mag a-apply for that. Bad Behavior has blocked 35061 access attempts in the last 7 days.